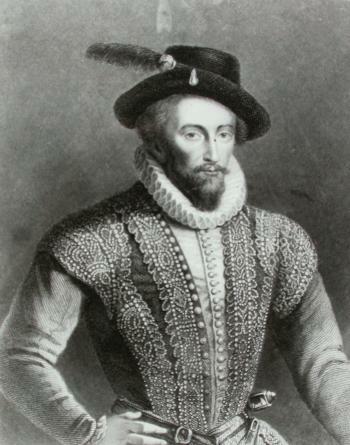 Sir Walter Raleigh funded and authorized the expeditions to Roanoke Island. Image courtesy of the North Carolina Office of Archives and History, Raleigh, NC. 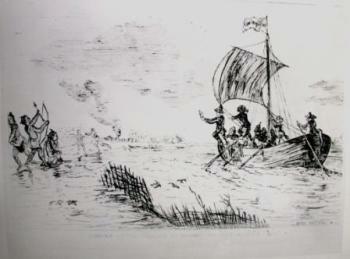 The first landing on Roanoke Island in July 1584. Image courtesy of the North Carolina Office of Archives and History, Raleigh, NC. Although Raleigh did not lead these expeditions to the New World, he funded and authorized them. Under Philip Amadas’s and Arthur Barlowe’s commands, two ships sailed from England on April 27, 1584 and landed on the coast of North Carolina on July 13, 1584. This landing marked the first time the English flag waved in the New World. During the first landing, the English colonists unsuccessfully tried to establish good rapport with the Indians, and lacked proper provisions for permanent settlement. So, the colonists returned to England. Raleigh reported the discovery of Roanoke Island to Queen Elizabeth I, and the new territory was named Virginia, in honor of the Virgin Queen. Raleigh sent a second expedition to Roanoke Island and appointed Ralph Lane as Governor. The colonists set sail on April 9, 1585. The Lane colony was intended to be a military post for men only. Because Lane’s colony lacked sufficient supplies, this second settlement was also abandoned. Shortly thereafter, Sir Richard Greenville arrived with winter provisions only to find the colony abandoned. On July 22, 1587, John White landed on Roanoke Island with 120 men, women, and children. As governor, White hoped to establish the first permanent English settlement in the New World by developing a self-sufficient economy and agriculture. On August 18, 1587, the first English Christian was born: Virginia Dare. White and the colonists also tried establishing a peaceful relationship with the Indians. White believed survival in the New World necessitated peaceful coexistence. And for a while after contact, whites and Indians lived peaceably. An Algonquian Indian named Manteo, for instance, was introduced to the English during the first expedition at Roanoke and was later baptized and named Lord of Roanoke on August 27, 1587. In November, 1587, White sailed back to England to report to the Crown on behalf of the colony. White was unable to return to Roanoke Island for over two years. When he returned the only sign of the colonists were the letters “CRO” carved on a tree and the word “CROATOAN” carved on one of the palisade’s entrance posts. White searched for the colonists, but to no avail. The fate of the Roanoke Island colonists is unknown, and the Lost Colony remains a mystery. John H. Wheeler, Historical Sketches of North Carolina, from 1584-1851 (Philadelphia, 1851); Karen Ordahl Kupperman, Roanoke: the Abandoned Colony (Tottowa, NJ, 1984); Mattie Erma Edwards Parker, ed., North Carolina Charters and Constitutions, 1578-1698 (Raleigh, 1963).